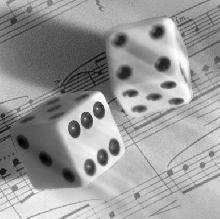 Dice Game a Winner; Listening to new classical compositions can be dicey, but this is a sure thing. Contemporary classical compositions can be something of a crapshoot for even the most jaded concert-goer. But rest assured that Maestro Andrew Litton and the Dallas Symphony Orchestra rolled nothing but sevens and elevens when they presented the world premiere of Musical Dice Gameby Robert X. Rodríguez. Commissioned by the DSO in commemoration of the 250th anniversary of Mozart's birth, the 15-minute work for string orchestra is based on a fanciful Mozart chamber piece that employed dice to determine its parts. The primary difference between the original and this new work is that, in Rodríguez's version, the game is fixed. There is nothing random about the tautly structured composition. Especially interesting was the positioning of the players in this work. Litton had equal numbers of violins, violas, cellos and double basses to his right and left. One side of the stage frequently played against the other. The work also has a "spiraling" feel that gave it an exceptional sense of forward motion. It was one of those rare new compositions that audiences will want to hear again... There is no chance of rolling snake eyes at this concert. Beautiful! Having been persuaded/challenged by the DSO to go where angels fear to tread, Rodríguez created a composition guided by Mozart’s stochastic Würfelspiel rules that is notable for its novelty and sheer musicality… superbly constructed... a moving piece of music in its own right, and one that also invites us to critically rethink Mozart’s own compositional methods and computational composition in general.